I rushed home from work on Wednesday evening to make this dish. I got to my apartment by 6 PM, and thought I’d have plenty of time to make it and photograph it in natural light. But with the strange cloudy weather and incoming fog, there was barely any light left by the time I started cooking. I raced to get this dish on the table. Luckily for me, it took under 15 minutes, start to finish. Shakshuka is a Middle Eastern dish, with particularly popular twists found in Turkey, North Africa, and Eastern Europe. 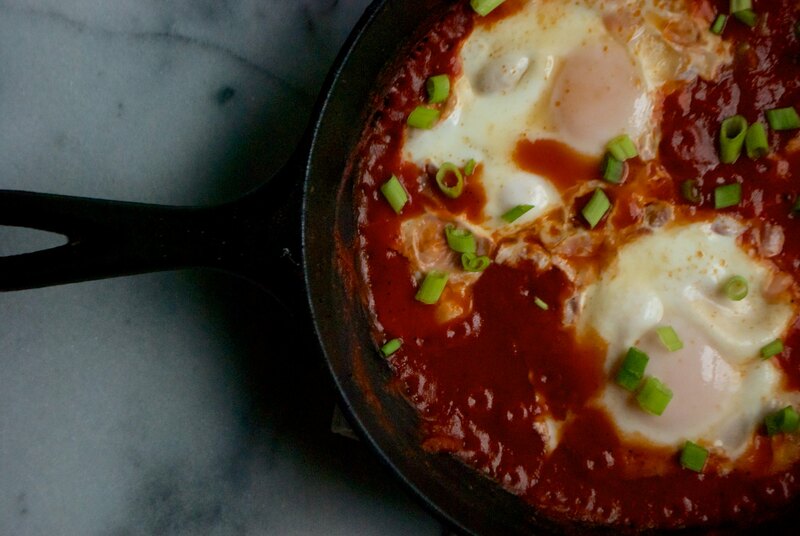 Traditionally, shakshuka is made of a base of onions, fresh peppers, and tomatoes, stewed and simmered into a sauce. Poached eggs are nestled on top. This version is a little simpler to make, and it’s my own take on a much-loved dish. I like the spicy peppery kick of harissa, and the extra depth of flavor from the tomato paste. Green onions replace regular ones for flavor and simplicity– they’re milder, but they also function as both base and garnish. It’s hard to believe that I haven’t written anything on this blog in a month…Especially when I went through phases when I’d write twice a week, then at least once a week. Lately I’ve been busy with school and travel and teaching and work, and I haven’t had as much time to cook up new things in the kitchen. Luckily these potstickers are just the ticket during busy times. They’re customizable. They take a while to mix, fill, and fold. But once the hard work is done, they’re quick to cook… And you can cook them from frozen. The mushroom & greens filling is savory, a little spicy, but very light. 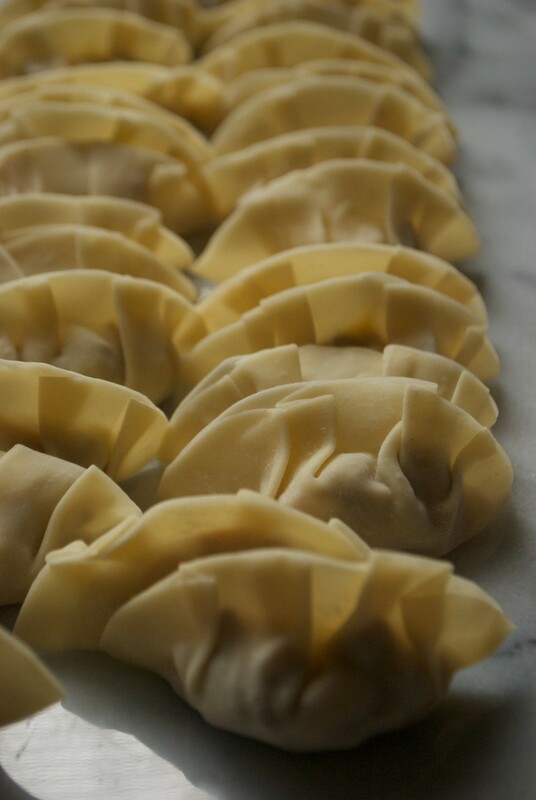 Potstickers cook up with crisp bottoms and delicately soft tops. The filling cooks down in volume, and the mushrooms and cabbage release their liquid to make a sort-of broth. I like making these potstickers with kale instead of napa cabbage for flavor. (Cabbage just happened to be what was in my fridge.) If you’re going for something more substantial, I’d recommend filling these with sautéed mushrooms and onions. I’ve even made a cooked minced mushroom and nut filling that worked exceptionally well, and made these a lot heartier.